Relief Riders International (RRI) has exceeded all expectations, and in one short year has become a pioneer and leader in the VolunTourism field. In addition to its two upcoming rides to Rajasthan, RRI is planning a special Tsunami Relief Ride in response to the ongoing need to support those who have suffered the devastating effects of the recent tsunami in Sri Lanka. Building on its success working with relief agencies in Rajasthan, RRI’s Tsunami Relief Ride will take a group of 10 riders on a 170 km relief mission through the Tsunami stricken beaches of the Southern province of Sri Lanka. The ride begins in Matara and will end in Yalla. Along the way we will help rebuild 4 schools and set up medical camps in 3 villages. As we provide relief, our journey will take us on a vibrant beach ride, through an amazing natural game reserve. 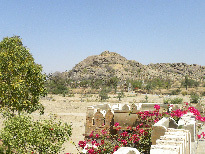 We will also visit Buddhist temples along the way. 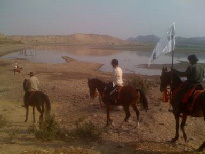 Rajasthan Relief Rides are scheduled for October 6th – 21th 2005 and again February 11 – 26 in 2006. Trips begin with an overnight stay at the Imperial Hotel in New Delhi then quickly move to the extraordinary Fort at Dundlod. Once there, riders familiarize themselves with horses and those who prefer to travel by jeep or camel carts all work together to organize the Relief Caravan. RRI has done extensive work with the Indian Red Cross to develop a relief program that beings much-needed medical care and supplies to the people who need them most. Our HIV/AIDS education program seeks to bring critical information to the villages we visit. During our recent February trip, RRI treated 1160 patients at three medical camps and an additional 400 children in 4 pediatric camps held at local schools. Three of the four schools are seriously under-funded by the government and operate on very limited budgets. We distributed notebooks, pencils, drawing pads, crayons, markers, globes, maps, and sporting equipment. Another important aspect of our relief work is our goat distribution program. Many families just barely survive, and we give two goats to struggling families. Not everyone has the time or inclination to take a Relief Ride, but RRI invites people who want to fight hunger to participate in a significant way by purchasing a goat for $65. RRI promises to find worthy homes for them. 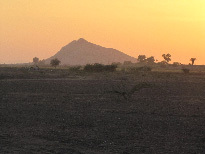 Our adventure ride/ humanitarian mission is woven into a trip that features a backdrop of great natural beauty, visiting ancient villages and old forts. 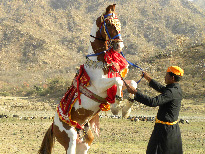 Riding on beautiful Marwari horses, or by jeep, we travel to a land rich in culture and wildlife. Whether it is moonlight dinner and an evening of traditional Rajasthani dance in Kochor or a bonfire & traditional Indian drumming performance in Kaladera, RRI riders come to know a magical land. Visit here view a slideshow of our most recent trip.